I use activators often to help accelerate my compost pile. Does your compost pile need one? You can gauge this by how long it takes your compost pile to shrink. With warm weather, adequate oxygen and a good mix of nitrogen and carbon items, your compost pile should sink considerably as it turns to humus. If it doesn't, it might need a compost starter, an activator. When building a compost pile, the goal is to balance carbon items with nitrogen items. Nitrogen is needed as fuel by the microorganisms as they break things down. If you have enough nitrogen items in your pile, you don’t need to add nitrogen. However, if you don’t have enough nitrogen, the pile won’t heat up, and will take forever to turn to humus. I usually have more dry carbon items to compost than I do green nitrogen items. When this happens, I add nitrogen as a compost accelerator. Adding in a shovel full of aged chicken litter, horse, goat or cow manure will really help to heat up a compost pile. Bedding materials from rabbits, horses and goats contain both urine and feces, and will also help speed things up. This last one might surprise you. If you can get over the “yuck” factor, human urine actually isn't a bad choice. It's free, sterile when secreted, has very little odor if used within 24 hours, is quite available, and works great. This in the form of nitrogen I use to inoculate my compost pile. It's quite easy to keep a 2 quart juice container in the bathroom so that, as needed, I can empty it each day onto my compost pile. Good soil is filled with microbes. Just sprinkle in a little soil now and then as you build your compost pile. Weeds added from your garden automatically carry in a little soil with their roots. 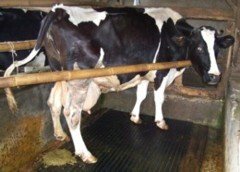 Raw milk is filled with many strains of beneficial bacteria, and as a compost inoculant a few ounces diluted in water can treat a whole pile. Compost tea is probably the best way to inoculate a compost pile. When adding compost activators such as raw milk or compost tea, it is helpful to mix in a few tablespoons of sulfur free molasses to jump start their proliferation. Another microbe food item I add is concentrated ocean minerals. This is not only a food source for the bacteria, but incredibly helpful to soil and plants. When added to compost, it is digested by the bacteria. When plants feed on the compost they receive a wonderful buffet of trace minerals. Click here to learn just how important these trace minerals can be to our health. 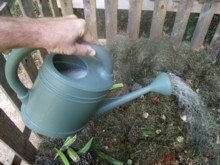 Another way is to compost directly in the garden. In the fall, I lay down some crushed eggshells to supply calcium (can you see the eggshell pieces in the picture? ), then I spread an inch or two of garden residue, such as shredded leaves, pine needles, and freshly mown grass. This is all good worm food, and the grass supplies a little nitrogen. Next I add four inches of fresh wood chips. Wood chip mulch is one of the best things we can do for our soil. As wood chips break down, they add a stable form of humus to the soil, which will provide a good soil structure for many years. Finally, I wet the compost in my garden with the following compost activators to turn all of this into humus and plant food. I apply the following mixture with a watering can over about 50 square feet. 1 gallon nitrogen fertilizer (I use human urine for this). This provides the nitrogen needed to break down all those great carbon sources. Aged animal manures will also work. 2 ounces ocean trace minerals. As mentioned above, trace minerals are vital to a garden and to my own health. I add them to my garden every time I get the opportunity. 2 ounces raw milk (unpastuerized). This is a great idea, as it supplies a wide array of microorganisms. 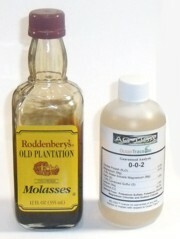 2 ounces sulfur free molasses. This food source causes a few thousand microorganisms to multiply to billions. Composting is one of the best gardening practices I know of. I have both a compost pile and a compost bin, but I also compost mulches directly on my garden plots. Because of my efforts to include organic matter in my soil, lab tests say that my organic matter is around 5%, which is really good! 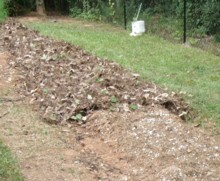 This amount of organic matter is a great start to a healthy, productive garden. Happy gardening!